The “Justicie atque iniusticie” gallery in the Rare Book Collection’s Flickr site now contains all of the illustrations from our copies of Guillaume Le Rouillé’s Justicie atque iniusticie. We own the first edition of this intriguing work (Paris: Claude Chevallon, 1520). In addition, we own the 1549 Lyon edition of the 18-volume Tractatus Universi Iuris; volume 1 contains Le Rouillé’s essay with different renderings of the illustrations. “Justicie atque iniusticie” also appears in our 1584 Venice edition of Tractatus Universi Iuris, but without illustrations. Guillaume Le Rouillé (1494-ca. 1550) was a French jurist, public official, historian, publisher, bookseller, merchant, and poet. “Justicie atque Iniusticie” was his first published work; other editions include Lyon 1529, Lyon 1530, Lyon 1531, and Paris 1534. Other legal works that he published included Le grand coutumier de Normandie (Paris 1539), and Le grand coutumier de Maine (Paris 1535). Below is the “beast of injustice” from the 1520 edition, gobbling up the innocent. The beast’s twelve legs are labeled to represent those who support or promote injustice, including disobedient youths, iniquitous princes, negligent bishops, immodest women, and undisciplined commoners. Thanks to Nicholas Makarov, a junior in Yale College, for providing biographical information on Le Rouillé. Another provenance puzzle solved! 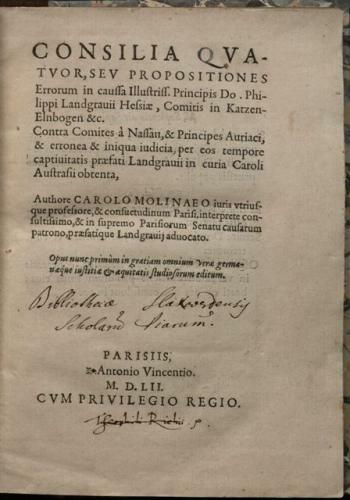 I was intrigued by the inscription on the title page of Charles du Moulin’s Consilia quatuor (Paris, 1552), because I had remembered seeing the same inscription on a law dictionary I had purchased when I was at the Tarlton Law Library, University of Texas at Austin: Jakob Spiegel’s Lexicon Iuris Civilis (1554). The colleague who took my place at Tarlton, Elizabeth Haluska-Rausch (Rare Books Librarian and Archivist) was kind enough to decipher the inscription, and provided considerable detail on the book’s early owner. The inscription reads “Bibliotheca Slakoverdensis Scholarum Piarum”, i.e. the library of the Piarist college in Schlackenwerth, the modern day Ostrov, Czech Republic. The Piarists are a monastic order dedicated to education. The order’s official name is Order of Poor Clerks Regular of the Mother of God of the Pious Schools (Ordo Clericorum Regularium Pauperum Matris Dei Scholarum Piarum). Thanks to Elizabeth Haluska-Rausch for solving this puzzle for me. An image of Tarlton’s Lexicon Iuris Civilis, with the inscription “Bibliotheca Slakoverdensis Scholarum Piarum”, can be seen on Tarlton’s website, announcing their current exhibit, “Rare Law Dictionaries at Tarlton Law Library.” If you’re in the Austin area, this exhibit is well worth a visit. You can now take a video tour of the Lillian Goldman Law Library’s Rare Book Collection, thanks to Yale Law School’s Office of Public Affairs. The 20-minute tour is available as Rare Books Library Tour - Part 1 and Rare Books Library Tour - Part 2, in the Yale Law School’s YouTube channel. You can also view the entire video on Yale Law School’s website. Kaitlin Thomas, Office of Public Affairs, organized the project and conducted the interview. Dan Griffin of Information Technology Services was the videographer and editor, and provided the voice-over. Thank you Kaitlin and Dan!